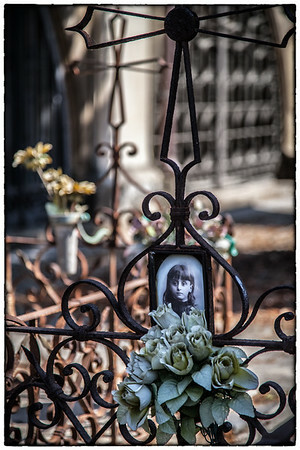 Symbolizing death, cemeteries are both feared and revered. In this solemn setting I often feel like an intruder with my camera but there are stories to be told. These memorials are silent narratives of the lives of loved ones who have passed and the families who pay tribute to them. I honor the deceased with these images giving voice to their legacies once more. I listened with my eyes and in the whispers found renewal amidst decay. Each image solicits inquiry. Questions will outnumber answers as you interpret incongruous relics. Listen to the whispers and create your own eulogy. In this setting honoring the dead, life is revealed.